A High-level Political Forum on Sustainable Development Side Event highlighting opportunities for policy and institutional shifts that can help countries advance the SDGs in a consistent and effective manner. The 2030 Agenda enjoin all countries to shift towards a sustainable development pathway that gives equal opportunities for all people and generations. Meeting this ambitious goal not only requires more financial and technological resources, but significant changes in the way we design, implement and monitor policies. A truly transformative shift as called for by the Sustainable Development Goals (SDGs) requires integrated and inclusive approaches across whole-of-government and whole-of-society including the poorest and most vulnerable. Leaving no one behind entails consistent approaches to address the multiple dimensions of inequality which is driven by an exclusion from economic opportunities, social services and natural resources. Ensuring policy coherence is an essential objective for building a sound policy framework that accelerate progress towards the SDGs. This High-level Political Forum on Sustainable Development (HLPF) side event is intended to enable experience sharing, identify policy options for developing an integrated and inclusive approach to policy making and monitoring, and launch a global partnership in support of policy coherence for sustainable development, as called for in SDG target 17.14. This event is co-organized by the governments of Sweden and Mexico, the Organization for Economic Co-operation and Development (OECD) and World Resources Institute (WRI) in collaboration with a coalition of think tanks. 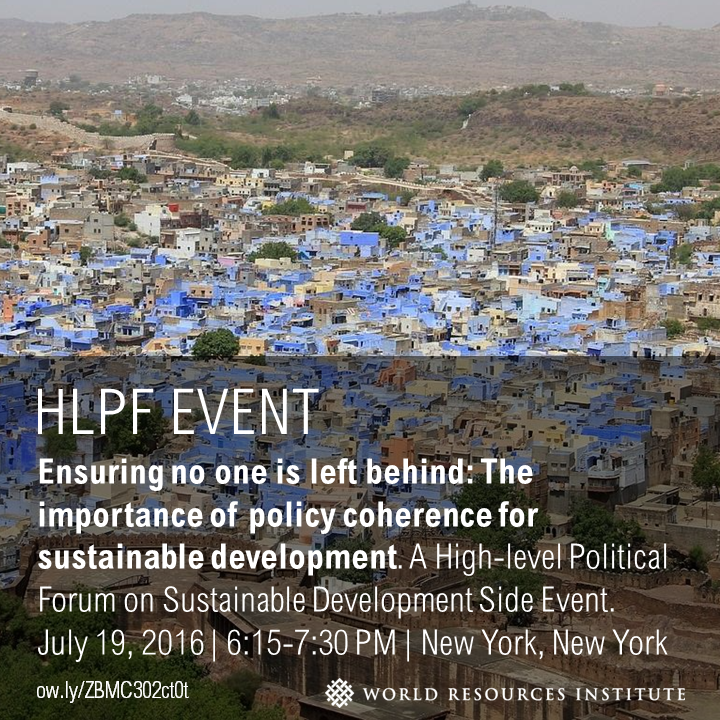 Attendence is limited to registered participants to the HLPF.